Start your review of George Huang. Send a message to George Huang. Thank You! Your message has been sent to George Huang at Whitby Oshawa Honda. "Above and Beyond - S.Raymer"
Picked up my 2019 Honda CR-V Touring two weeks ago and could not have made a better choice in vehicle to purchase..George and Peter went over everything in great detail and made sure I knew how everything worked prior to leaving the lot...they even took turns watching my kids while we finished up the paperwork..If your looking for a new car and don’t want to be given a run around I suggest coming to George and Peter at Whitby Oshawa Honda as they take great pride in their work and treat each customer like family. I’m sure after this purchase and quality of customer service I received this will not be the last car I buy from them. Thank you again! Very helpful and assisted with everything in making the right decision for me. Love the car and would strongly recommend Whitby Oshawa Honda if you’re looking for a new car. Thanks George and Peter! "Lease of 2019 Honda H-RV"
Worked with George and Peter for the lease of our second Honda. We leased a 2019 Honda H-RV and we received the vehicle in perfect condition. We were able to return our lease early and get into a vehicle that more met our current needs. Everyone made the process easy and painless. Very impressed with Whitby Oshawa Honda and we are loving our new vehicle. Definitely will be back! 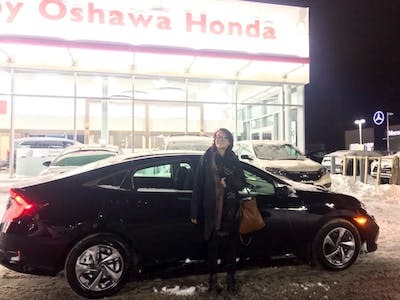 This is my second Honda with Whitby Oshawa Honda and every time my experience has been great. Peter and George was always there to answer any questions I had at any time which made the experience even easier. I live about 200km from the dealership so most of my interaction with George and Peter was long distance. They handled this little complication in excellent form and were ready and waiting on the two occasions I was actually on site, both of which involved heavy snowstorms. 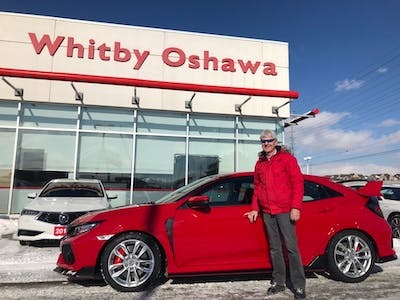 Excellent experience from the moment I walked in to the moment I drove away in my new Honda Civic. Very good customer service and clarity on the purchase. Much appreciated. The service is very poor. No one returns calls or emails. We wanted to purchase a car and made a Deposit however after talking to our insurance realised it's way to expensive so we decided not to purchase. This began a 2 week headache of trying to get in touch with George to get our deposit returned only to be told its final sale. I was shocked because we didn't purchase. The terms and conditions do say full refund but as of this moment we still don't have it. They may have been telling people this information for a long time and misleading them to believe it. Worst service ever. I booked an appointment a week in advance for Saturday. Whitby Honda apparently does not put much weight into scheduled appointments as I waited 1.5hrs to see this employee, while people arriving later than me got ushered right in. After finally sitting down with this employee he went to go look for a car that we could test drive. He comes back 15 minutes later to inform us there was no vehicles of the type we wanted to test drive on the lot. Strange seeing as I scheduled an appointment a week in advance. Unbelievable waste of time. It does not surprise me that this dealership and employee have terrible reviews. DO NOT WASTE YOUR MONEY HERE. "Reprehensible Treatment of a Senior"
My father, aged 84 purchased a used Acura sedan last Monday. On Tuesday evening he received a call to arrange a Thursday pickup. With cash in hand he arrived Thursday to be told that the employee, (since fired) had made an error and that the car would be ready the following Monday at 2:00 p.m. Promptly at 2:00 today my father was told by salesman George that he would need to wait until 3:00 as they had not switched the ownership. George reappeared 5 minutes later to say that the car would not be ready at all as the windshield needed replacing. Sales managers were “in a meeting”. Salesman George was not able to explain who was responsible for managing the preparation of the vehicle for pickup. Apparently no one was overseeing this process at all. It is difficult to determine whether or not this is a case of blatant ageism worthy of a complaint to the Human Rights Commission. Perhaps this dealership makes a practice of ineptitude and incompetence? Calls to the Sales Manager were not returned. This dealership is not worthy; spend your dollars where you will be valued as a customer and not treated in this unconscionable manner.